In his book New Lands, New Men, William Goetzmann describes the 18th and 19th centuries as the “Second Age of Discovery.” The First Age of Discovery, kicked off by the Mediterranean powers of the 15th century, developed maritime routes to Africa, Asia and the Americas. Best known of these early discoverers is Christopher Columbus who sought to extend Spanish dominion, proselytize natives, and bring home piles of loot, objectives followed by his 16th and 17th century successors. By the 18th century, however, the goals of exploration had changed. Empire and commerce still had their place in voyages of discovery, but they increasingly made room for other, secular objectives such as natural history, ethnography, and natural philosophy, changes that reflected new attitudes about knowledge and learning back home in Europe. 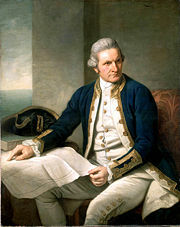 Captain James Cook, who led three expeditions to the Pacific in the 1760s and 1770s, became the poster-child of Enlightenment voyaging. Of modest birth and education, Cook was not himself a philosopher of nature. But his command of three discovery expeditions – to study the transit of Venus, discover the extent of the Antarctic continent, and investigate the possibility of a Northwest Passage – set the benchmark for scientific expeditions to come over the next century. Cook’s chronicles and those of his men of science (Joseph Banks and Johann Forster) provided models for the expeditions of Jean-Francois de la Perouse (France), Alessandro Malaspina (Spain), and Charles Wilkes (United States) among others. 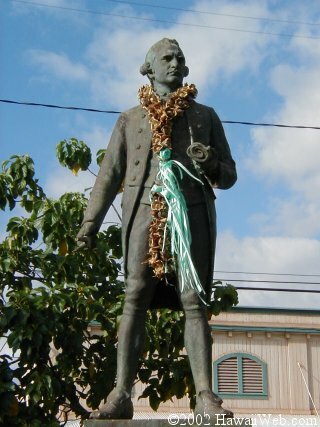 Cook’s serendipitous discovery of the Hawaiian Islands in 1778 (which he named the Sandwich Islands) was also, ultimately, the cause of his demise. 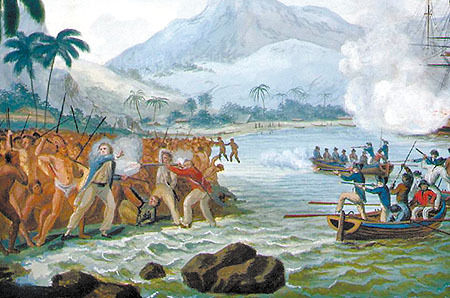 After a series of quarrels with Hawaiians of the Big Island, Cook was killed in a skirmish with islanders on the beach of Kealakekua Bay. The National Library of Australia and the Center for Cross-Cultural Research have developed an impressive website on Cook’s legacy, South Seas: Voyaging and Cross-Cultural Encounters in the Pacific. Focusing on Cook’s first voyage, South Seas offers accounts from Cook, Joseph Banks, Sydney Parkinson, and John Hawkesworth. A world map of Cook’s route allows the viewer to zoom in features of interest, identifying the dates of Cook’s passage, landfalls, as well as diary entries for dates mentioned. A set of four “Cultural Atlases” offer maps and descriptions of the native peoples which Cook visited in Tierra Del Fuego, the Society Islands, Botany Bay, and Endeavour River. South Seas also offers some indigenous histories and European reactions to Cook’s voyage. There are a few “links to nowhere” on South Seas. Perhaps the project ran out of funding before it was fully completed. But even in its unfinished form, there are gems here for the student of Enlightenment voyaging.